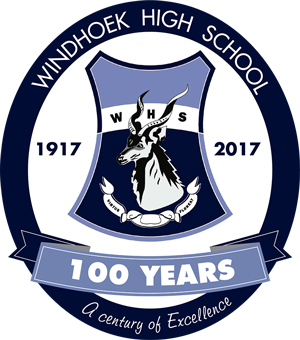 Windhoek High School, a school where tradition combines with technology to create a wide spectrum of possibilities and opportunities. Religious and moral principles, strict discipline and teaching and coaching of the highest quality, are the cornerstones of this educational establishment. Where more than a 1000 learners and teachers are allies an together we help shape our destinies. Todays achievements art tomorrows standards. Our vision is to create a centre of excellence at WHS. Virtus Floreat : Virtues Flourish. The idea of Mr WJG Anderson, the first principal of WHS, and used for the first time in 1919. The Old Scholars Association Motto is Virtus Semper Floreat: Virtues will flourish forever. establish quality involvement of parents, the community and alumni. WHS, the school of choice, inspiring learners towards a flourishing future. We value VIRTUE and honour the proud traditions of our school. We value CLEAR GOALS for teacher and learner achievement. We value INTEGRITY and a firm attachment to moral principles. We value CHARACTER and will not compromise what is right. We value RESPECT for self and for others. We accept RESPONSIBILITY for our education, decisions and actions. We value nurturing A POSITIVE ATTITUDE towards teaching, learning and life. We value the TRUTH and cherish honesty and truthfulness in all we say and do. We value HUMILITY as a key factor in personal success. We value CREATIVITY and strive to implement new ideas from teachers, learners and parents if it can add positive value to the well-being of the school. Special programs to develop self-knowledge, self-esteem, leadership skills, basic life skills, etc. Professional administration and organization of the sport program by a specially employed sports Organizer.